In today’s video on YouTube I share a cooking vlog as I make my easy slow cooker meatloaf recipe. As promised in the video, here’s the full recipe with step-by-step directions. You can even click to download the recipe at the end. In the slow cooker meatloaf recipe video, I make enough for two meatloaves. One meatloaf, of around 3 lbs, is enough for my family to have dinner one night with leftovers for the following day. I additionally make a large pot of brown rice, as well as steamed broccoli, as our side items. Someone recently said to me on Facebook (which this is a good point! 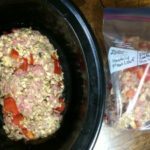 ), “Seems to me it’s made the same way as any meatloaf, except you cook it for four hours instead of one.” My quick answer to that is to use this slow cooker meatloaf recipe as a freezer meal! I like to make several of these slow cooker meatloaves at one time. That way I can put the extra meatloaves in freezer bags for a busy day. When that busy day comes all I need to do is pull the slow cooker meatloaf from my freezer that morning and dump it in the slow cooker. Yay! Piping hot meat loaf at dinner time and I didn’t have to *make* a meat loaf that day. Can I get an, Amen? ~ Also in today’s video I added in 1/4 of a cup of milled flax. The family couldn’t tell, and it makes me feel like I’m doing something to get healthy items into every meal. 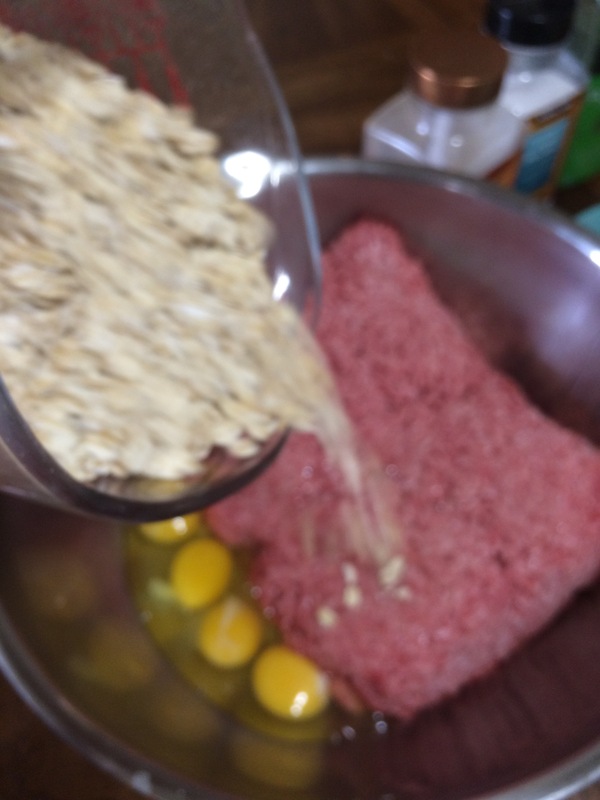 Add in 6 eggs into a large mixing bowl, along with ground beef. Next, pour in 6-cups of old fashioned oatmeal. Then, pour in your 4-6 cups of chopped vegetables. Next, pour in your desired spices. After that, begin to blend your slow cooker meatloaf ingredients. This is when I really get my hands dirty. 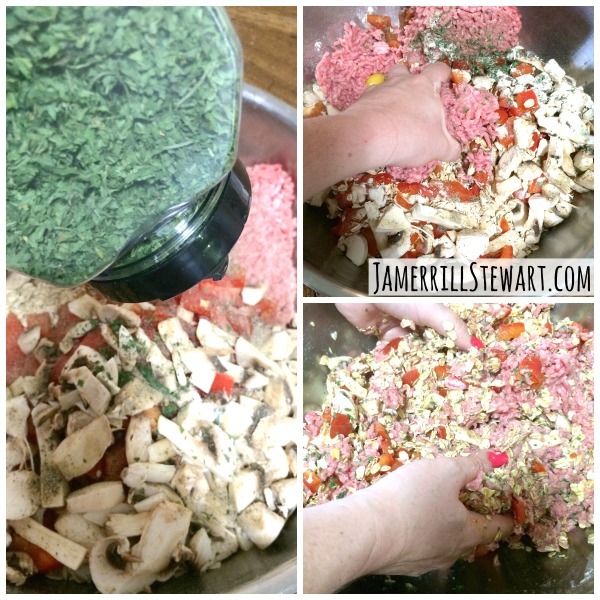 I work for several minutes to mix the ingredients by hand. Once all of the ingredients are mixed I add my meatloaf to my slow cooker. You can take a moment to shape it into a true loaf shape. I set my slow cooker on high for 4-hours. Slow cooker times can vary. I bag the additional 3-lbs of meat loaf left for a slow cooker freezer meal. All I need to do is pull my slow cooker meatloaf out on a busy morning and the “hard work” of dinner for the coming night is almost done! Click here to watch the FULL easy slow cooker meatloaf video! 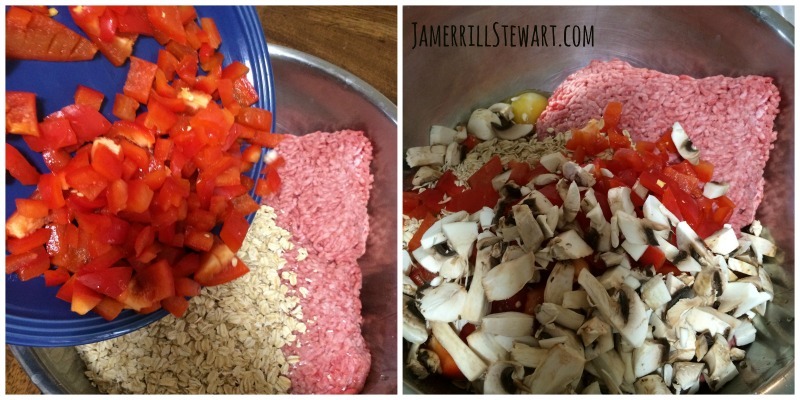 Enjoy this easy and healthy Slow Cooker Meatloaf Recipe. 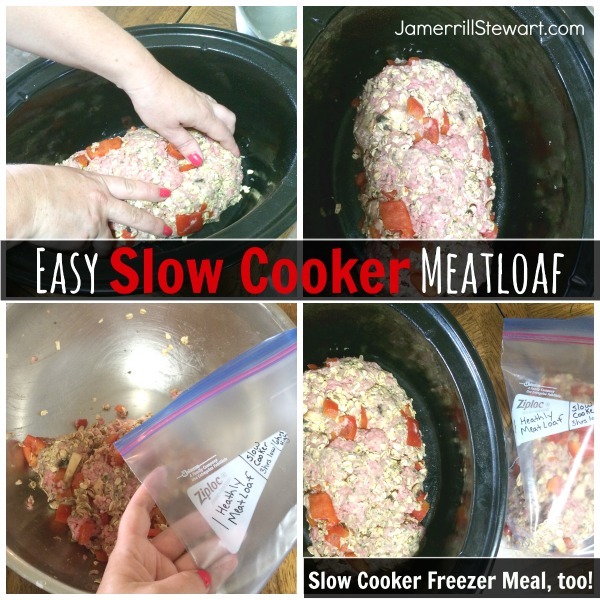 You can also easily make two and save one meatloaf for an extra slow cooker freezer meal! Gather your ingredients to begin mixing items. I find a large metal bowl very handy. 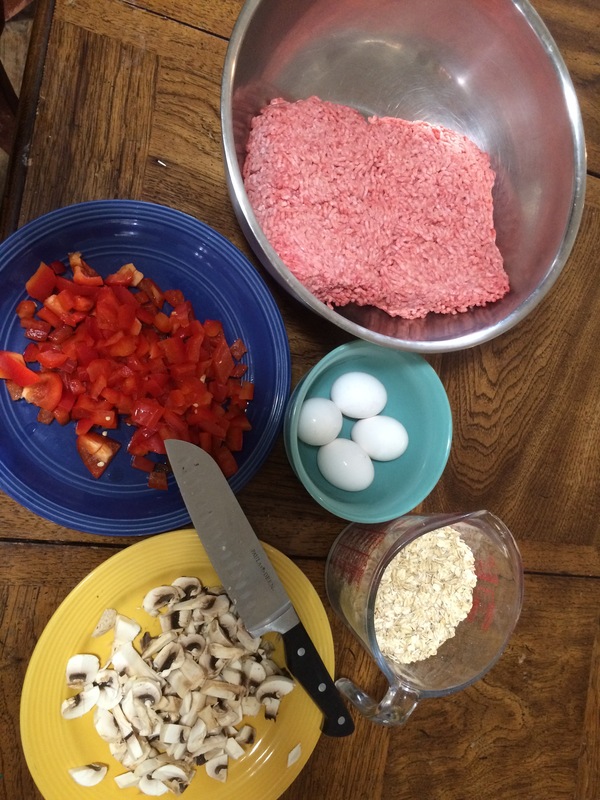 Combined the 6 .lbs of ground beef, 6 eggs, 6 cups of old fashioned oat meal, 4-6 cups of cut veggies, spices, and even milled flax if you’d like. Work these ingredients together with your hands for several minutes. Once all ingredients are mixed, divide mixture in half. Place half of the meatloaf into a slow cooker for 4-hours on high. Place the other half of the meatloaf (approx 3-lbs) into a Ziplock bag to be stored in the freezer for a busy day’s family dinner. Excellent recipe. Loved the flavors of meatloaf and veggies. Adding bell peppers and onions to veggie mix is definitely a future experiment to be tried. 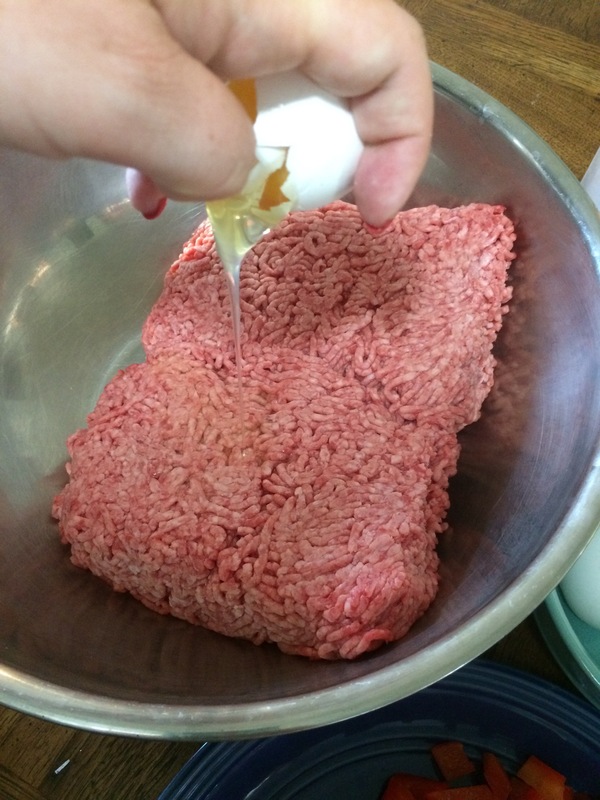 Saw a similar recipe that used pork for part of the meat, so may try that as well. Thank you for sharing we are all looking forward to enjoying the leftovers! Hi, This looks like a great recipe. If you are taking the meatloaf straight from the freezer and putting it in the crockpot, how long is it cooked and on High or Low temp?.